International Journal of Research in Health Sciences,2015,3,2,278-281. 1-MD, Associate Professor, Department of Biochemistry, Navodaya Medical College, Raichur, Karnataka, INDIA. 2-MD, Assistant Professor, Department of Pharmacology, Navodaya Medical College, Raichur, Karnataka, INDIA. Introduction: Electrolyte measurement especially for sodium and potassium are frequently required for patients admitted in the hospital. Serum electrolytes are most affected parameters by preanalytical variables like serum clot contact time. Aim: To evaluate if the time lag between centrifugation and sample analysis has any effect on the stability of electrolytes in serum. 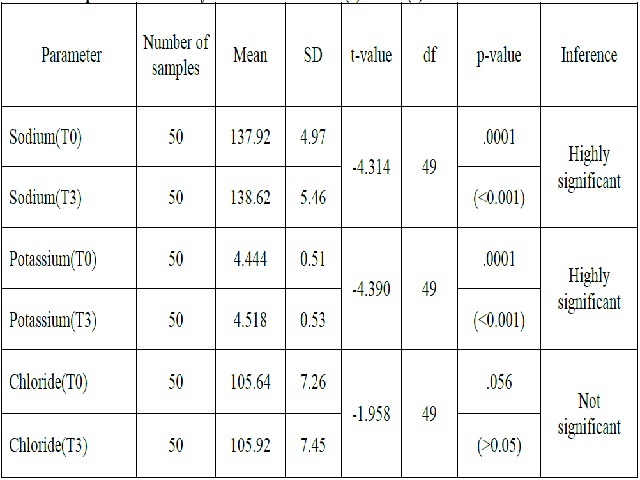 Material and Methods: The study was conducted in the department of biochemistry, Navodaya medical college Hospital and research centre, Raichur, Karnataka. Fifty blood samples were drawn in replicates and brought to the laboratory. One batch of the samples was processed immediately and serum was separated for electrolyte analysis i.e. Na, K and Cl. The second batch of replicate samples were processed after three hours and assay performed. Results: The mean Sodium, Potassium and Chloride concentration were 137.92±4.97mmol/L, 4.44±0.51mmol/L and 105.64±7.26 mmol/L at 30 min (T0). The mean Sodium, Potassium and Chloride concentration after 3 hours of serum clot contact time were 138.62±5.46mmol/L, 4.52±0.53mmol/L and 105.92±7.45 mmol/L (T3). All the electrolytes show an increasing trend with delay in processing. Both sodium and potassium clearly shows a significant difference at T0 (30 min) and T3 (3 hours ) with a p value of <0.001 for both. For chloride, the p-value was insignificant (0.056).Conclusion: The stability of both the electrolytes (sodium and potassium) is found to be sensitive to prolonged serum clot contact time. Thus it is essential that the blood samples obtained from the patients be processed timely and the analysis done immediately.